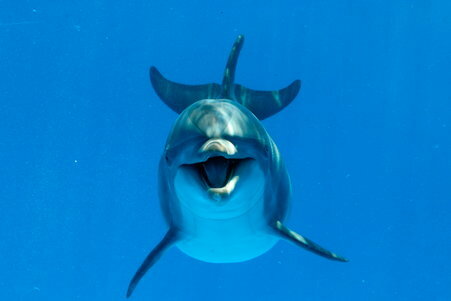 Bottlenose dolphins simplify and raise the pitch of their whistles to be heard above underwater shipping noise. Christopher Intagliata reports. The noise could be a problem for marine mammals, which, like us, use sound to communicate. "Just like if we're in a noisy bar, we have to shout to each other, they might have to do that too." Helen Bailey is a marine biologist at the University of Maryland Center for Environmental Science. But what they found was that dolphins dumbed down the complexity of their whistles and raised their pitch, when they were competing with shipping noise. <whistle clip 2> Which apparently helps, but could also hurt, their ability to communicate. "By using simpler calls, yes, there is a risk they're not communicating as much information as they would if it was quieter. Also for younger dolphins they actually learn these sounds from hearing other dolphins. So they're hearing this much simpler language." The survey site is the proposed future home of a wind farm - which could mean lots of noise as the huge towers are installed. Until then, it's the chronic roar of ships and boats that Bailey wants people to ponder. "I think people think about boats in terms of the emissions, just like with cars. And I think what we need to think about is sound is also an emission."